Dennis Rodman benched by Yao Ming in Pyongyang friendly? PYONGYANG, North Korea (AP) — Has Dennis Rodman, the former NBA star-turned pal of North Korean leader Kim Jong Un, been benched for Chinese hoop legend Yao Ming? The former Houston Rockets center and eight-time NBA all-star took center court in Pyongyang, North Korea’s capital, on Tuesday as Chinese and North Korean basketball players held a friendly match, part of a high-profile sports exchange between the two countries intended to help thaw ties that had been growing chilly over the past year. Senior ruling party officials turned up for the game, but Kim, who was famously serenaded with the birthday song by Rodman in Pyongyang in January 2014, didn’t attend. The Unity team won the match, 107 to 106. 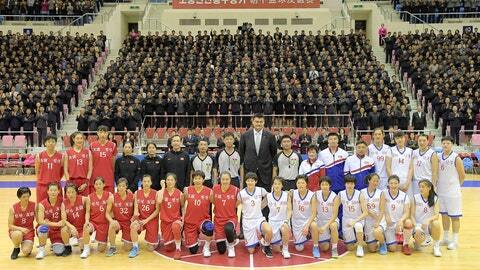 Yao Ming, towering over everyone else in the stadium, congratulated the players at the end of the game. “Today’s friendly match will be a display of top basketball skills and the great sportsmanship of all the players from both of our countries,” Kim Il Guk, the North Korean minister of sports, said before the game began. After a period of frosty ties, North Korean leader Kim Jong Un has visited China three times this year, and traditional proclamations of friendship between the two neighbors have been resurrected. Speculation continues as to whether Chinese President Xi Jinping will visit North Korea in return. Yao Ming, who at 7’6″ (2.29 meters) was one of the tallest players in the NBA, is the head of China’s Basketball Association. He arrived with a high-level delegation on Monday that includes China’s equivalent of a sports minister.